Craig Stuart-Paul, the CEO of Fiberight, provides a tour of the company's Hampden facility in November 2018. 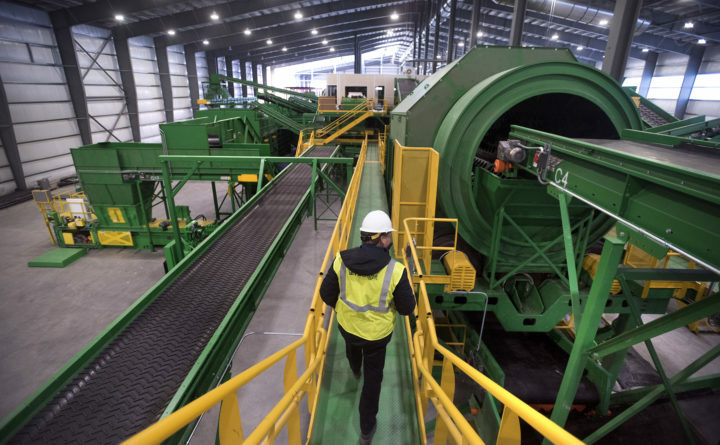 Concerns about a much-delayed $69 million recycling plant under construction in Hampden have compelled three Hancock County towns to consider building their own transfer station. Since August, selectmen from Brooklin, Brooksville and Sedgwick have met twice, toured a transfer station in Orrington and are forming a committee to investigate whether they should build a station as a backup to the Fiberight waste-to-biofuel facility, which is due to open by April, said Bill Cohen, chairman of the Board of Selectmen of Brooklin. The selectmen are motivated, Cohen said, by many questions, including: What if Fiberight fails? The facility was supposed to begin receiving waste from more than 100 Maine towns and cities in April 2018, but has been delayed, Fiberight leaders say, by many things, including a legal challenge to the project’s environmental permits, weather that slowed construction last winter, and a changing market for recycled goods. Residents of the three Hancock County towns take trash to the Blue Hill-Surry Transfer Station, under an agreement with Municipal Review Committee, a group representing 115 towns and cities across central, northern and eastern Maine. From there it goes to a landfill. Brooklin pays $92,000, Brooksville $95,000 and Sedgwick $100,000 annually to use the Blue Hill facility, according to Cohen, Sheahan and Gayle Clifford, a clerk in the Brooksville Town Office. The selectmen have not found a potential transfer site and doubt that any change in the present routine is likely for at least a year, Sheahan said.